In October 1991, three weather systems collided off the coast of Nova Scotia to create a storm of singular fury, boasting waves over one hundred feet high. Among its victims was the Gloucester, Massachusetts-based swordfishing boat the Andrea Gail, which vanished with all six crew members aboard. "Drifting down on swimmers is standard rescue procedure, but the seas are so violent that Buschor keeps getting flung out of reach. There are times when he's thirty feet higher than the men trying to rescue him. . . . [I]f the boat's not going to Buschor, Buschor's going to have to go to it. SWIM! they scream over the rail. SWIM! Buschor rips off his gloves and hood and starts swimming for his life." It was the storm of the century, boasting waves over one hundred feet high a tempest created by so rare a combination of factors that meteorologists deemed it "the perfect storm." When it struck in October 1991, there was virtually no warning. "She's comin' on, boys, and she's comin' on strong," radioed Captain Billy Tyne of the Andrea Gail off the coast of Nova Scotia, and soon afterward the boat and its crew of six disappeared without a trace. In a book taut with the fury of the elements, Sebastian Junger takes us deep into the heart of the storm, depicting with vivid detail the courage, terror, and awe that surface in such a gale. Junger illuminates a world of swordfishermen consumed by the dangerous but lucrative trade of offshore fishing, "a young man's game, a single man's game," and gives us a glimpse of their lives in the tough fishing port of Gloucester, Massachusetts; he recreates the last moments of the Andrea Gail crew and recounts the daring high-seas rescues that made heroes of some and victims of others; and he weaves together the history of the fishing industry, the science of storms, and the candid accounts of the people whose lives the storm touched, to produce a rich and informed narrative. The Perfect Storm is a real-life thriller that will leave readers with the taste of salt air on their tongues and a sense of terror of the deep. It was the storm of the century, boasting waves over one hundred feet high - a tempest created by so rare a combination of factors that meteorologists deemed it "the perfect storm". When it struck in October 1991, there was virtually no warning. "She's comin' on, boys, and she's comin' on strong", radioed Captain Billy Tyne of the Andrea Gail off the coast of Nova Scotia, and soon afterward the boat and its crew of six disappeared without a trace. 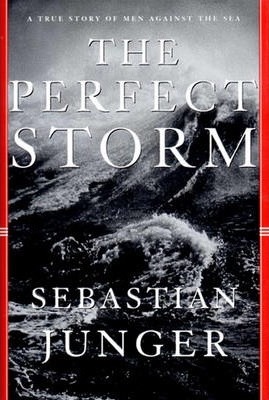 In a narrative taut with the fury of the elements, Sebastian Junger takes us deep into the heart of the storm, depicting with vivid detail the courage, terror, and awe that surface in such a gale. Junger illuminates a world of swordfishermen consumed by the dangerous but lucrative trade of offshore fishing - "a young man's game, a single man's game" - and gives us a glimpse of their lives in the tough fishing port of Gloucester, Massachusetts; he recreates the last moments of the Andrea Gail crew and recounts the daring high-seas rescues that made heroes of some and victims of others; and he weaves together the history of the fishing industry, the science of storms, and the candid accounts of the people whose lives the storm touched. The Perfect Storm is a real-life thriller that leaves us with the taste of salt air on our tongues and a breathless sense of what it feels like to be caught, helpless, in the grip of a force of nature beyond our understanding or control. We know, on the strength this stark and compelling journey into the dark heart of nature, what it feels like to drown. Sebastian Junger is the author of A Death in Belmont and Fire. He has been awarded a National Magazine Award and an SAIS Novartis Prize for journalism. Most recently, he has been reporting on the war in Afghanistan for Vanity Fair. He lives in New York City.